I used a trout fly rod and reel setup to target kahawai at the river mouth. The blue Deceiver pattern worked a treat as did several of my other saltwater fly creations. When there is a lot of kahawai present this is tremendous fun with hook-ups on every cast! Kahawai fishing is exciting stuff. Pound for pound the humble kahawai is one of the best fighting fish in the sea. It is such a good fighter on rod and line that it is regarded as a game fish by the International Game Fish Association. The Current IGFA kahawai All-Tackle Record stands at 19 lbs. 4 ounces. Kahawai school by size. Though a big kahawai might weigh 5kg as you will read below, they can get much bigger too! They eat small fish and crustaceans, particularly krill. I have caught kahawai packed full of red whale-feed (krill). Kahawai are found in the whitewater adjacent to river mouths. They occur in vast schools over summer. With binoculars in hand at Goose Bay, Kaikoura, during the summer months, you can almost always see a kahawai school somewhere along the coast. There can be huge schools of kahawai, barracouta, and other fish a kilometre offshore, but the kahawai, in particular, will chase baitfish so close to the beach you can easily see their backs in the waves! “Pound for pound a kahawai would tow any trout backwards through the water.” They really are tremendous fighters and exciting to catch on rod and line. They repeatedly jump clear of the water when hooked and often escape to fight another day. I say kahawai are New Zealand’s greatest fighting fish! They always give a good account of themselves when hooked. If you really want to have some fun try casting into a school of big kahawai on light spinning gear or try taking them on with the fly fishing gear you normally use for trout. Huge schools of kahawai can “hang around” a river mouth for weeks on end providing exciting sport, and a fish or two for the smoker. They are amazingly strong runners and surprisingly powerful fighters for their size! Sometimes you can hook and loose several kahawai all on the same cast as they will have a go at almost any rapidly retrieved lure! I have witnessed large schools of kahawai at the mouth of the Waimakariri River that has “camped” there for weeks, even months, at a time. Some years they are there all summer long. Watch for screaming seabirds that often hover above the baitfish and kahawai schools diving and swooping on fleeing baitfish. Kahawai schools can come and go. One minute everyone is hooked up to a fish. A short time later the school has moved off following a school of baitfish. Your best option is to cast out and see what happens. Often you think they aren’t there because you can’t see them. When big kahawai schools are at the mouth of the Waimakariri, and other rivers, you can often see their backs as dark shapes in the breakers. Kahawai aren’t afraid to come right into very shallow water when chasing baitfish like smelt, which are also called silveries. At the mouth of the Rakaia River, and many other places, I have often seen kahawai chase the silveries right up onto the stones. With a big school of fish “sitting” in the river mouth kahawai spinning can get very exciting indeed. To make really long casts at river mouths when fishing for kahawai I use my salmon gear consisting of a 13-foot carbon fibre rod matched with an Abu 7000 or Abu 7500C bait caster reel. The best fishing method is to cast out across the surf as far as you can. Point your rod down towards your lure as you wind. Every now and again your ticer should pop out of the water and skim across the top just like a fleeing baitfish! It depends on where the kahawai are; sometimes long casts are required to hook them, while at other times you can catch them with a hand-line. The current IGFA All-Tackle World Record for kahawai stands at 19 lbs. 4 ounces ( 8.74 kgs) . That fish was caught by Stephen Muller at Currarong, Australia, on 9 April 1994 . The heaviest kahawai I have seen caught in the South Island would have been no more than 6 or 7 pounds at the most, so a kahawai weighing 19 lb 4 oz is an incredibly big specimen. Amazingly kahawai grow to least 3 ft (1 m) and 33 lb (15 kg). Australian Salmon In Australia kahawai are known as “Australian salmon” which is quite wrong as this species is in no way related to the true salmon or their relatives. Salmon have never been successfully introduced into Australian waters. Kahawai are found around New Zealand, Tasmania, and the southern coast of Australia. They are found in waters of the continental shelf, estuaries, bays and inlets. Kahawai school in shallow, open coastal waters or form large surface aggregations in deeper water. Kahawai are not as plentiful around New Zealand today as they were prior to the 1970s. Extensive overfishing by commercial fishing boats was to blame. Though there are still plenty of this species around the vast schools that would once “sit” for months at a time, over summer, off river mouths and harbour entrances, are now sadly a thing of the past. In an update to this article written in February 2015, it seems that in some areas kahawai numbers have increased markedly. Big schools have been seen around the coast of the South Island again during the summer of 2014/15. At the Waimakariri River mouth, and also at the Rakaia and Rangitata Rivers, kahawai have been present almost constantly and in huge numbers. Kahawai have been so plentiful off Canterbury river-mouths this summer that many anglers are trying new fishing methods for the first time. Many are experiencing tremendous sport catching kahawai on light trout spinning gear and fly rods. Long may this trend of increasing fish numbers continue. Don’t forget to quickly release any unwanted kahawai unharmed back into the sea. In this regard, we must all do our bit to look after the kahawai fishery. The best way to find large concentrations is to look for feeding birds. These often indicate the presence of kahawai, which chase smelt, sprats and anchovies, into tightly packed schools. Kahawai will take baited hooks but are much easier to catch on spinning lures. Kahawai are used to chasing bait fish so chasing a silver ticer would be quite a natural reaction for a kahawai. These fish are very strong and will often bend your treble hooks. I have found the best hooks to use on kahawai lures are 1/0 VMCs. Kahawai will jump clear of the water as they attempt to dislodge the hook. Whilst airborne they also shake their heads from side to side. This often results in lost fish. Shorter lures are harder for the fish to dislodge. 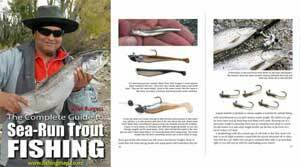 Ideally, you want the lure to slide down the line to give the hooked fish less leverage – in the manner of a Tasmanian Devil trout lure. Mind you the loss of a few kahawai as they jump out of the water is all part of the fun of catching them. I have always found bright silver ticers to work the best on kahawai. These are about the same size as a silvery which the kahawai schools chase at river mouths. However, I am sure that when they are in feeding mode they will hit just about anything that is moving. 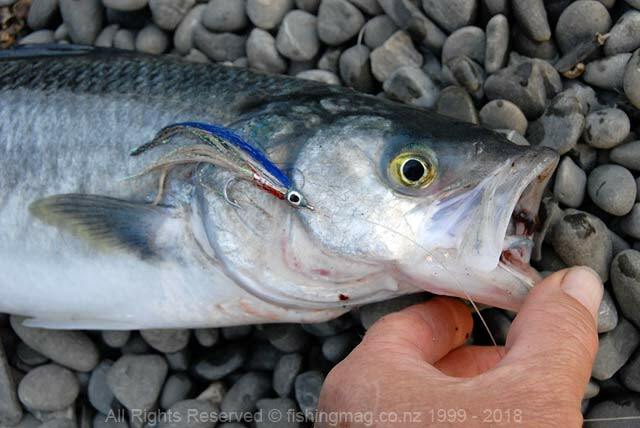 The most exciting way to catch kahawai is on fast moving lures: ticers and small jigs are ideal when casting near the edge of a feeding school. Kahawai are powerful light tackle fighters. A kahawai hooked on 6 lb monofilament or braid is a real handful, and quite a challenge when hooked from shore. As kahawai often come right in close to the beach they make ideal targets for those anglers up to the challenge of landing a kahawai on saltwater fly fishing tackle. I suggest you pack plenty of backing on to your fly reel! The rods I prefer are either Kilwell Enticers or my English Harrison. These are long rods designed to cast ticers over 100 metres for salmon when fishing the surf. Although this is fairly heavy gear for kahawai, in Canterbury over summer, salmon are the target species, so most anglers will fish for both species on the same long rods. Much depends on how far out the kahawai school is. Sometimes they are very close right in the breakers. Long casting distance affords more options and is always a big advantage. 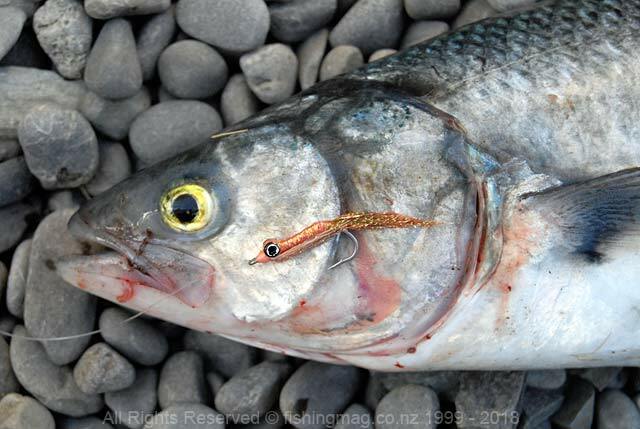 After experimenting myself and questioning many successful and expert anglers I am convinced that your hook-up rate on kahawai is greatly improved by fishing small fish-shaped metal jigs that resemble a sprat or smelt. These small silver fish are the favourite prey of kahawai and a lure that closely resembles them in size and shape is the most readily taken. 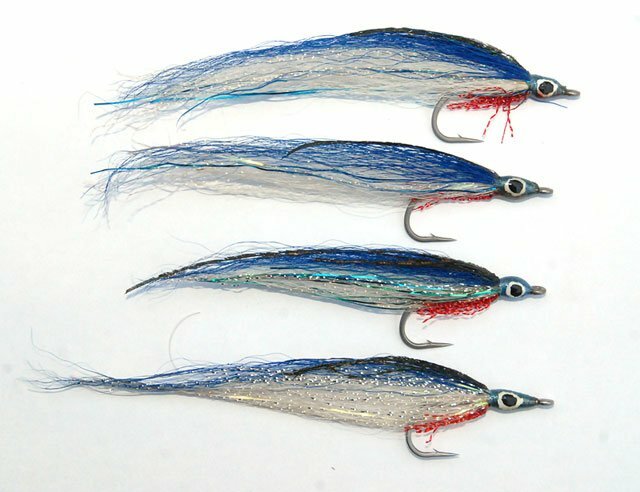 In a similar vein these small metal lures are more effective both at hooking and holding kahawai if they are fished with a single hook instead of a treble. The lighter metal jigs (lures) are best fished on small diameter braided line equivalent to 6 lb mono, or lighter. Lighter lures have more action and don’t sink too quickly in shallow water. This type of lure has more weight near the hook-end enabling longer casting distances. 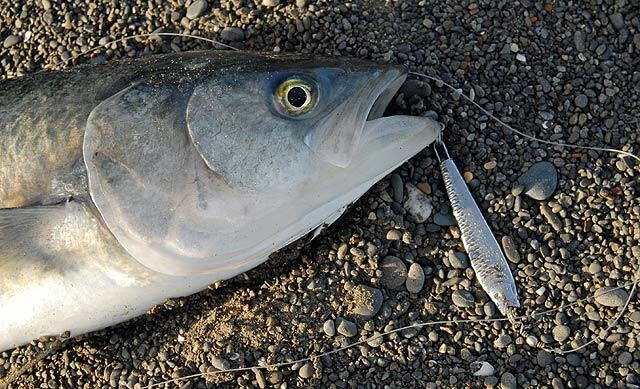 When fishing in the shallow water at the mouth of the Waimakariri River, which has a sandy bottom, I recommend fishing with light braid and silver coloured metal jigs weighing under 20g. The lighter lures will have more action when retrieved. If using your long salmon rod, particularly when fishing with monofilament line, a heavier jig around 40g will cast much better than a lighter one that doesn’t load your rod efficiently. Soft baits are excellent for kahawai. especially the smaller 5cm paddle tails. The only downside being the kahawai chomp them to pieces fairly quickly. Kahawai will readily take a fly. The secret is to get into a casting position in water deep enough for schooling fish. At the mouth of the Rakaia River, this is quite possible when the sea is flat and fish are close to the beach. At the Waimakariri River mouth, which is shallower, shown here, it is a bit more difficult as the fish are usually further out. But it is possible all the same. You need to strip your line quite fast for the kahawai to strike. But again surf and river conditions have to be optimum. Kahawai will readily take a fly. The key to catching them on a fly rod is to get into a position where you can present your fly to schooling fish in sufficiently deep water. When conditions are optimum you can have a lot of fun catching kahawai on a fly rod. You can get a saltwater fly rod and reel outfit if you think you will enjoy this style of fishing, or as many do, you can start out with a simple trout fly rod and reel and weight forward line. Ideally, you want the sea to be calm and the water clear. Kahawai doesn’t like dirty water. You also need a cooperative school of kahawai to be close to shore. A fast line stripping technique will trigger more strikes. Many kahawai are caught at river mouths by anglers fishing for sea-run brown trout. The kahawai will just as readily go for a Grey Ghost or Yellow Rabbit on a size 2 hook as a trout will. If you tie your own flies you might like to make up a few Deceiver patterns in a blue/white and silver combination. Add some pearl Mylar Flashabou and the kahawai are sure to go for it. Kahawai fishing at river mouths is a very exciting form of fishing and something I look forward to every year.